Chatterjee, Saibal (2003). "1990–2001: Designer Cinema". In Ramchandani, Indu. Encyclopaedia of Hindi Cinema. Encyclopædia Britannica, Inc. pp. 117–134. ISBN 978-81-7991-066-5. Dengel-Janic, Ellen; Eckstein, Lars (2008). "Bridehood Revisited: Disarming Concepts of Gender and Culture in Recent Asian British Film". In Eckstein, Lars; Korte, Barbara; Pirker, Eva Ulrike; et al. Multi-Ethnic Britain 2000+: New Perspectives in Literature, Film and the Arts. Rodopi. pp. 45–64. ISBN 978-90-420-2497-7. Joshi, Namrata (2012). "Shahrukh Khan: Yuppie Prince of Liberalized India". In Patel, Bhaichand. Bollywood's Top 20: Superstars of Indian Cinema. Penguin Books, India. pp. 231–242. ISBN 978-0-670-08572-9. Mazumdar, Ranjani (2014). 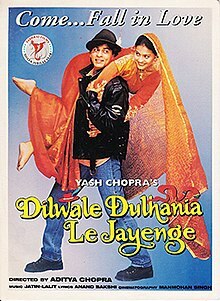 "Dilwale Dulhania Le Jayenge / The Brave-Hearted Will Take Away the Bride". In Barrow, Sarah; Haenni, Sabine; White, John. The Routledge Encyclopedia of Films. Routledge, New York. pp. 205–208. ISBN 978-1-317-68261-5. Mehta, Rini Bhattacharya (2011). "Bollywood, Nation, Globalization: An Incomplete Introduction". In Mehta, Rini Bhattacharya; Pandharipande, Rajeshwari V. Bollywood and Globalization: Indian Popular Cinema, Nation, and Diaspora. Anthem Press. pp. 1–14. ISBN 978-0-85728-782-3. Mukherjee, Madhuja (2012) . "Mustard Fields, Exotic Tropes, and Travels through Meandering Pathways: Reframing the Yash Raj Trajectory". In Roy, Anjali Gera; Huat, Chua Beng. Travels of Bollywood Cinema: From Bombay to LA. Oxford University Press. pp. 35–54. doi:10.1093/acprof:oso/9780198075981.003.0004. ISBN 978-0-19-807598-1. Sarrazin, Natalie (2008). "Songs from the Heart – Musical Coding, Emotional Sentiment, and Traditional Sonic Identity in India's Popular Film Music". In Kavoori, Anandam P.; Punathambekar, Aswin. Global Bollywood. New York University Press. pp. 203–219. ISBN 978-0-8147-4798-8.